I just finished this apron this afternoon, when the little one was going nuts in his jumperoo - showing off for Brett, who was watching/playing with him. 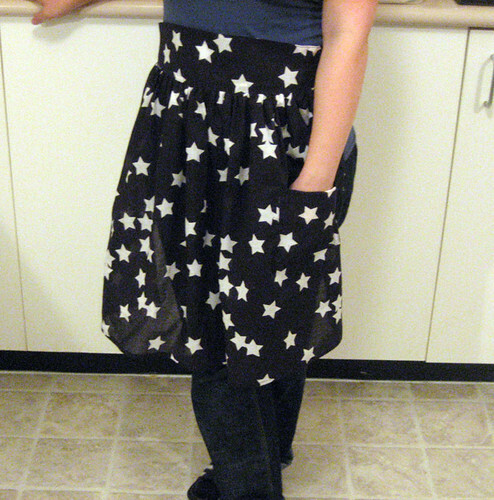 Since cutting this apron out a few weeks ago, I was only able to sew a seam here and there. I swear my wee one has a sixth sense as to when I'm sitting at my sewing machine cause he always wakes up from his nap the second I turn the machine on. Sewing this bad boy was easy peasy...the fabric, well...not so easy peasy. It's very thin and gauze-y. Trying to sew the waistband only made the fabric distort the shape. I made this apron based off of a vintage pattern from the 50's. I think if I were to sew this again, I would shorten the length and make it wider at the sides apres gathering. I would also taper the ends of the ties in the back. 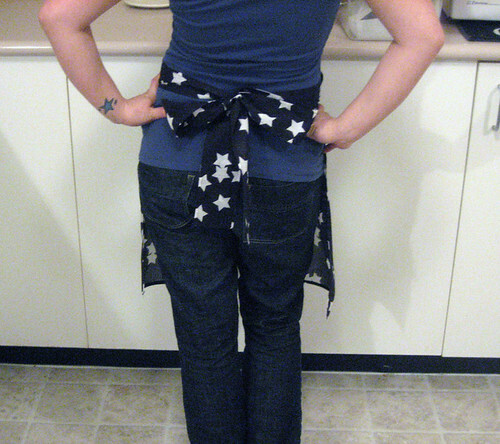 And, depending on the fabric, I'd add lightweight fusing to the waistband so that it would keep its shape. I made the ties a little longer than what the picture of the pattern called for. I like how the apron turned out but truthfully, cause of how wispy the fabric is, I don't think I would be using it while cooking. I'm not heartbroken about it though, it's a nice addition to my apron collection...which is made up of 2 other aprons so far. I managed to get to the fabric/quilting shop and picked up some FQs (fat quarters for those who don't know quilting terminology) for a project that I want to make for my baby. I also picked up a cute lemon print fabric that I plan on turning into an apron. So I'm off to cut some fabric before heading to bed...this time change has screwed me up. It's going to take a week and a bit for me to get with the program. Oh well, I might as well be productive 'til my internal clock is back to normal!